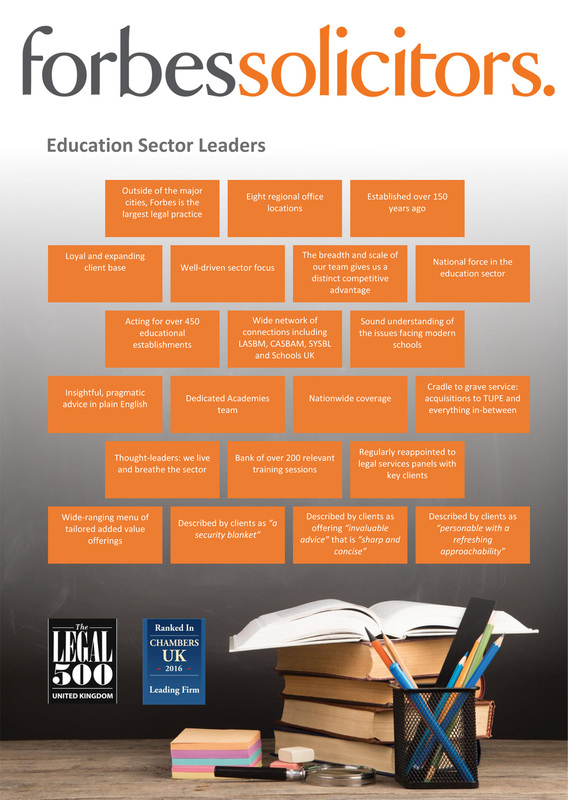 Schools UK understand the need for a quality service where HR & Employment issues are concerned. Whilst many Schools/Academies have relied on the council historically this not only reduces your budget but can be frustrating. At schools UK we have seen a genuine desire to have access to a lawyer or a qualified HR consultant to deal with any issues at the outset in a professional manner. In this regard Schools UK are delighted to have teamed up with Forbes Solicitors to offer precisely the kind of service required and without the burden of a financial constraint on your budget. HR and Employment support and advice is a vital part of the good governance and management of any School. Employees are the greatest asset of any School, and quality advice in the complex area is essential to the success of the School, and the wellbeing and development of pupils. Forbes Solicitors are therefore delighted to partner with Schools UK to oﬀer a comprehensive support service for HR and Employment law advice as part and parcel of Schools UK staﬀ absence insurance. • The equivalent of one full days attendance on site each academic year from one of our HR specialists or employment lawyers. The package set out above would cost an average primary school of 30 staﬀ approximately £2,250.00 to purchase privately; the costs for a larger School would be much more. Whilst our experience dictates that the majority of day to day issues will be dealt with within our standard package, should you require assistance with more complex matters, we are happy to engage in a face to face discussion to determine your precise needs, and provide a clear, competitive quote. For more complex matters and other legal services, Schools will automatically receive a 25% discount on our normal charges; or, as an alternative Schools can pay a one-oﬀ fee per academic year for this to be included as standard. • Complex disciplinary, absence, capability or grievance matters – from investigation to advice and support at any subsequent hearings; (What is considered to be complex is determined at our discretion, but will typically include matters involving Safeguarding issues, police investigations and multi-agency liaison).